Hollybeary Creations : YNS New Release Sneak!! Who's ready for the Your Next Stamp New Release? Today we are starting with Sneaks and tomorrow will be the full reveal with a Blog Hop where you can win a $25 GC to the YNS store. 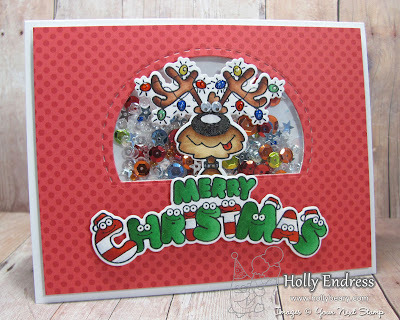 Today I'm sneaking the new set Jingle All the Way and the new Peek A Boo die cut. This set is so fun and there are a few other characters in it as well. I started with a panel of white card stock and I added some Pattern paper from Doodlebug to it then I cute the Window out with the Peek a boo die and created a shaker pouch for inside of it. I filled the shaker with several different sequins and bead mixes. Once the panel was assembled I added it to the front of a side folding A2 size card base. 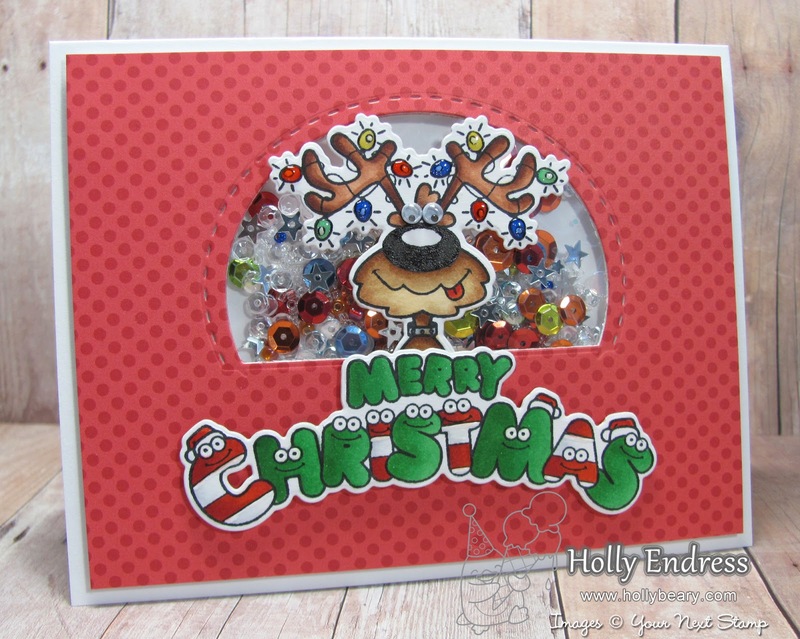 I stamped the Reindeer image and the Merry Christmas from the Jingle all the Way set onto some white card stock and colored the in with Copics I die cut them out with the coordinating dies and adhered them to the front of the card with dimensionals. I added some glossy accents to the lights on the reindeer and some fun googly eyes. Head over to the YNS blog for more Peeks at the New Release and be sure to stop back tomorrow for the Hop and your chance to win! Such cuteness! Love this shaker creation with an adorable image and the cartoonist font sentiment made me giggle! Your shaker reindeer card is too cute! 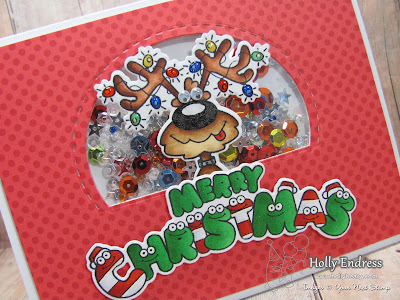 And I love how you colored the reindeer and that fun sentiment!!! !